What have you always wanted to know about your roof but haven’t had the chance to ask? If the topic of residential roofing makes your head spin, don’t worry. We’ve got you covered. Read on to get your biggest questions about roof maintenance and damage answered. My Roof Looks Fine to Me. Why Should I Perform Maintenance? In this case, seeing is not believing. There’s a lot more to your roof than meets the eye. Though you might not notice a leak or see much damage, some problems require further investigation performed by a trained professional. Internal and structural damage are typically the most costly and difficult to identify with a cursory glance. Weather elements often cause this type of extensive damage. Thunderstorms may damage the roof with gusts of wind, falling tree limbs and excess moisture. Likewise, rainfall can lead to rotting in the roof deck and mildew inside your home. Heavy winds may damage shingles and roof material by tearing, cracking or removing them completely. The sun can be brutal in our area, and is responsible for fading and deterioration caused by UVA/B rays. Moss may sprout from excess moisture gathered on the roof. This eventually will lead to rotting. Keep in mind that any kind of damage to your roof leaves your house extremely vulnerable. I’m Pretty Handy. Can’t I Just Fix My Own Roof? Unless you’re trained and experienced in roof repair, it’s not a good idea to start playing Mr. or Ms. Fix-It. Your roof is the most important element for protecting your home from the outside world. Without a well-designed roof, all of those weather elements are liable to make their way inside your house. Here’s the second thing to be aware of—it can be quite dangerous to repair your roof on your own. Roof repair usually means being high above the ground with tools; this can be tricky no matter who you are. It’s best to stick with a professional to avoid hurting yourself and/or damaging the roof further. 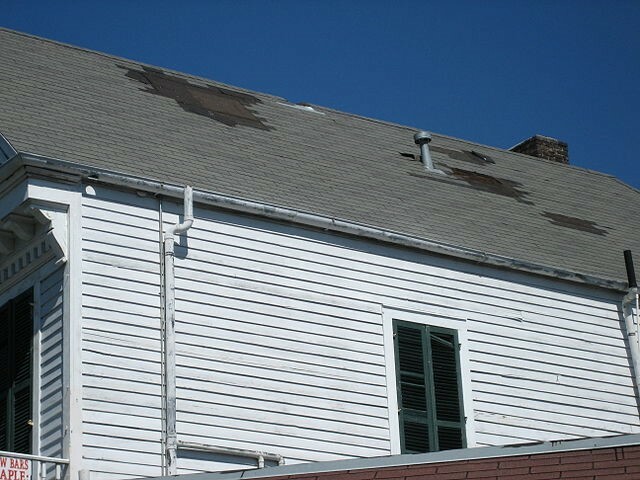 What are the Most Common Signs of Roof Damage? Leaking is, of course, the most obvious one. If your home feels more like Noah’s Ark than an actual house, you probably have roof damage. However, there are more signs to be aware of. Do you notice flashes of light inside your home? Cracks around the vents or chimney often point to roof damage. How about mildew, peeling wallpaper or damaged paint? Excess moisture coming inside the house from a compromised roof is usually the root cause. When’s the last time you checked your gutters? If you see sand-like particles inside them, you’re looking at shingle granules, a tell-tale sign of advanced damage. As for the exterior, look for faded, torn or missing roof material. How Can I Avoid Roof Damage? All roofs have to be replaced at some point. But there are things you can do to extend your roof’s life and avoid exacerbating existing issues. To prevent mildew and algae growth, keep bushes, trees and plants away from the perimeter of your home as much as possible. Doing so will also cut down on the extent of damage caused by wind and thunderstorms. Clean your roof regularly. While you’re at it, sweep out your gutters and downspouts. Sure, your roof will look nicer but it’ll also be in better condition. Remove debris to prevent build-up over time. Finally, make regular maintenance a priority. These routine check-ins performed by professionals will ensure that your home is protected, and your investment is safe. You’ll also catch any potential leaks or other issues before they turn into a major expense. For more information about residential roofing services and our maintenance program, contact JOI today.